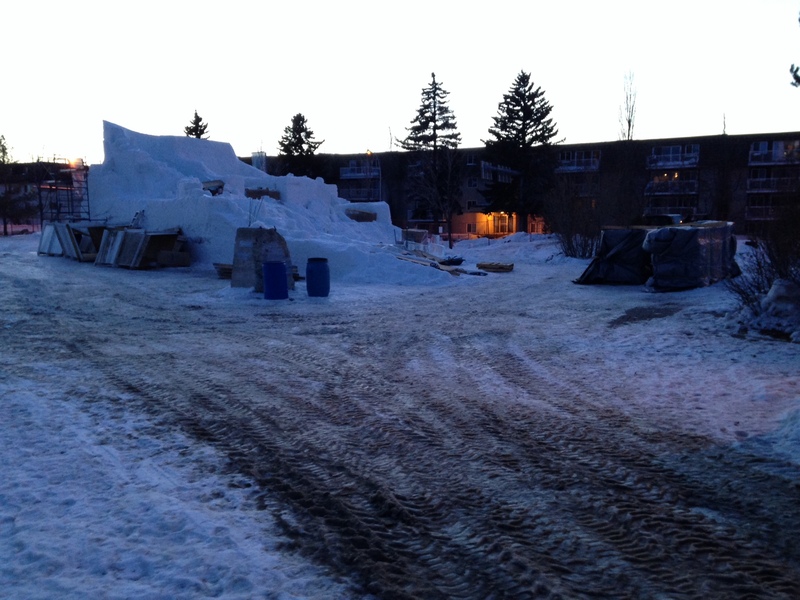 Ice on Whyte’s iconic ramparts of snow are being melted away by the warm weather, and built back up by Delayne Corbett. When the January cold dropped off into that warm, wild wind last week, I found myself sprinkling gravel on my sidewalk as quietly as I could in the morning. It was already an inconvenience having to address the fresh ice that had spread out over the walks, and when I saw a woman get out of her truck to move a branch that had blown down from our tree into the road… well, I’m not proud of it, but I slunk away with my bag of gravel, lest she think I threw the branch there or something, and harangue me into arriving even later to work. All in all though, the warmth was a treat. Which made me wonder who’d be really annoyed by the weather. That’s how I met Delayne Corbett. Delayne is the Artistic Director of the Ice on Whyte Festival — a fact I discovered when I penguined over to End of Steel Park and shouted across the gates that I had a microphone and I’d love to talk to anyone inside. Ice on Whyte, you see, is the local ice sculpting festival that spreads through Old Strathcona in January. I had a hunch that if anyone resented the temperature hitting 6ºC, it’d be the folk who had a week left to finish building a mini-empire of ice and snow. As an ice carver, Delayne said, 6ºC with full sun was a complete disaster. Delayne was the only one working on the site at the time, and he let me watch him for a while as he ripped cardboard covers off 150-pound rectangles of ice. He clamped one of them with metal tongs he swore were older than him, and threw it on the snow so he could “walk the dog” and shuffle it into place with the rest of the ice slide he was building. The slide would bring you to the bottom of a mountain of snow his team had stomped into the ground. All things considered, he was in good spirits. -15ºC, Delayne told me, is the ideal temperature for ice sculptors. The ice doesn’t crackle much when you add water, and the cold wicks away the sweat you’re building up. The warm weather made him want to rip off layers, but he couldn’t because it was so wet and goopy that he had to keep his rainpants on. Even worse, the wind had blown sheets of cardboard all around the site. That would have been okay, except that the record-setting gusts also tossed an 8-foot tall plywood box into the fences “like a bowling ball,” and he spent most of his morning gathering cardboard that had sailed into nearby streets. He said something that stuck with me though, about the ice slide and the whole business of working with ice. He was in the process of adjusting the slide to make it a little slower at the bottom, by adding a little more distance. I mused that people building roller-coasters didn’t have that luxury. That, I think, is a skill we could all stand to learn. You’ve got to work with what you’ve got. I also told this story for a 3-minute story challenge on CJSR. Have a listen.